I have only resubscribed to TopBox a couple of months ago and honestly have not been disappointed. This month TopBox added a teaser that if Benefit Cosmetics received 17K followers on Instagram, they would include a product in the November package. TopBox costs $12/month, shipping included and they offer multiple month subscription in 3,6 and 12 month increments. There are typically 4 beauty samples in each package. And, here we go! There is always a detailed information card in the package listing the items, how to use them, the cost and where to purchase. I LOVE mascara and have heard lots of good feedback about Eyeko. 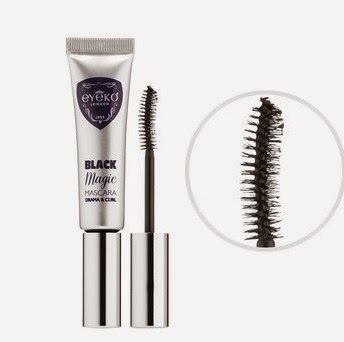 Black Magic is reputed to be the ultimate mascara that combined creates drama, volume and curl. It has a squeeze tube which is cool. Full size product is 0.29oz and costs $29 CDN and the sample received is 0.13oz. So about $13? Elizabeth Arden is a very well known name in beauty products. This is the Flawless Future Powered by Ceramide Caplet Serum. I don't know what that means... Honestly. It's a lightweight liquid serum with micro-caplets?? Looks pretty. Moisture barrier "reinforcer", evens skin tone, retexturize and reduces the appearance of the 1st signs of aging. I don't know - I'm a big skeptic when it comes to claims but if it feels nice, I'm in. 30ml costs $72 and can be purchased at The Bay. The size I received was 5ml. About $12. UniqOne is totally new. Never ever heard of this brand before but it is a Revlon Professional line. The All in One Hair Treatment is applied to damp hair which reportedly provides smooth, silky, shiny tresses. If you add it to dry hair, it refreshes the style. Costs $19.95 for a 150ml bottle.The sample is 9ml - $1.20. Check out uniq-one.com to see which salon nearish you carries the product. PS. Not Atlantic Canada. Last item in the Benefit Cosmetics item (as mentioned above). Stay Flawless 15-hour primer in stick form. Total value is $29.02. More importantly, will I use everything? Likely yes. The highlight? Mascara. Less spectacular? The hair product.